I “awoke” to baseball in 1967. I say “awoke” because I can’t find another way to explain the sense that nothing existed in my life before 1967 (when I was 7) and that, at least for a time thereafter, baseball would so define the “necessary” of every waking hour. Growing up in a small town in south-central Pennsylvania (population c1000), baseball was, literally, the only game in town and if you lived in that town you were a Phillies fan. Except I wasn’t. Sometime in 1967 my dad bought me my first glove—a lefty—after seeing me toss a small rubber ball against the steps going upstairs from near the front door of our house (he almost got me a righty but noticed I only used my left hand). And from the start I was a St Louis Cardinals fan. Why? Ronnie Sanger. Ronnie was hands down the best baseball player in town. Two years older than me, Ronnie came from a “baseball family”. His brothers had had or would soon have tryouts with professional baseball clubs and they each made it to the lower levels of the minor leagues. In Bowmansville, my home town, that was a level of success that was unheard of. I idolized Ronnie Sanger. And sometime before Ronnie came into my conscious mind he had met former St Louis great Stan “the Man” Musial (Stan died on 19 January, 2013) at spring training in Florida. He got Stan’s autograph, fell in love with the Cardinals and, well, so did I. But even though I awoke in 1967—and the Cardinals won the series over the Red Sox that year—it was not until 1968 that I really took notice of the team, its players and, especially a pitcher named Bob Gibson. 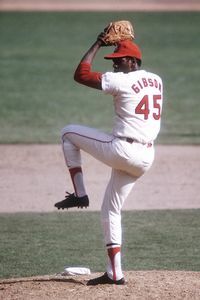 I was a pitcher too and Bob Gibson was the most amazing pitcher of that era. In 1968 he won 22 games—not bad but, incredibly, he gave up a paltry 1.12 runs for every nine innings pitched (and in those days he pitched the whole game—he started 34 that year and finished 28—a feat unheard of today). He struck out 17 Detroit Tigers in game one of the World Series that year—a record that still stands. I was crazy about Bob Gibson. He had a way of holding the ball behind his back before going into a full hands-over-head windup and flinging the ball towards home plate. I mimicked that motion every summer day as I threw a rubber ball relentlessly against the barn door in my backyard (though Bob was a righty and I was a lefty, as I said). It was always the World Series that summer (and several after that), and I (Bob) pitched a no-hitter every time out. I am sure there were a few times when I (Bob) struck out every single batter in the 7th game of the World Series. Martin died that spring and I know I had a glove on my hand the day I heard about it. I was in the kitchen and that is all I remember. King (as he was known in our house) was a communist and his death left no imprint except that there was a sense of relief that his rabble rousing was finally over. Also that spring, though I can’t remember exactly if it was before or after Martin Luther King’s assassination, I got a book about my hero Bob Gibson. Did I mention that Bob Gibson is black? Did I mention that I did not know any black people? Did I mention that I loved Bob Gibson? Anyway, I got the book through one of those “Scholastic” book fliers that came home from school about once per month. My parents never said no to letting me get at least one book, and to my amazement sometime that spring included in the list was a biography of Bob Gibson! I think I read that book about five times the first week I had it and the black and white pictures of Bob Gibson in a little league team photo, then in the minors and then pitching for the Cardinals absorbed my gaze for hours on end. But Bob Gibson’s biography was not just about his pitching exploits (which I had expected). It was about his life growing up in Omaha, his sickly childhood (asthma), and the shocking story of how the great Bob Gibson could not sleep in the same hotel room as his fellow teammates when he was coming up through the minors in the Cardinals’ organization. In fact, Bob Gibson told a lot of stories of how he was treated as a black man and how it was unfair (even and 8-year old could understand that). I remember being stunned and saddened but mostly confused. How could Bob Gibson be denied the same treatment as anyone else simply because he was black? It just made no sense. And in that small town—thanks in part to the confluence of baseball, Ronnie Sanger, the Cardinals and a great pitcher named Bob Gibson a different way of viewing the world took root. Martin, I was born too late to know you for what you were when I was 8 years old. I was born in the wrong place to be able to hear and see what you were about. I was born in the wrong family to understand the power of your message. But I was born in Bowmansville and thanks to baseball and Bob Gibson I was given a window—a glimpse—into the challenges of racism and the hope that change might come. And I learned that the agents of change in our land might even appear wearing a baseball uniform. Thanks for this powerful personal story. TV came to my school in Puerto Rico in the fall of 1968. The first program we saw was the World Series between Cardinals and Tigers. Ever since, baseball has been a mirror of life for me, often teaching me lessons of racial justice, but like life, mixed with paradoxes of injustice.